Situated on the edge of the river in Zhujiang New Town, the new Guangdong Museum, which opened last week, has been a triumphant success. Thousands of visitors have already flocked to witness the impressive building, with its fascinating exhibitions,the museum has on display over 166,000 items arranged across more than 20,000-square-meters of exhibition area. 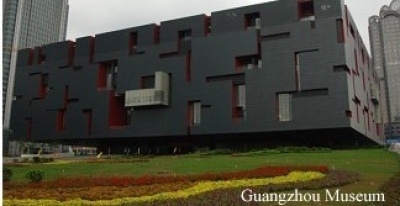 Like the previous Guangdong Museum, access is free to all three parts of the museum – Lingnan history, natural history and art. Tips: Tickets are free, but visitors are required to present their ID cards or passports to gain access to the museum. There is a limit on the amount of viewers each day. Businss Hours: Opens on Tuesday to Sunday, 9am to 5pm.